Last week, I was able to place an order for goodies from the upcoming 2011/2012 Stampin' Up! catalog, one of the great perks of being a demo. My order arrived on Friday and I put this together over the weekend. It's pretty much a case of this card by Tessa Wise, ﻿with a couple of changes. 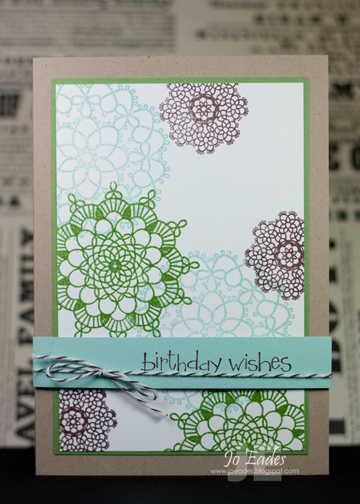 I've used the Delicate Doilies stamp set and one of the new 2011 - 2013 In Colours - Pool Party, along with Chocolate Chip and Wild Wasabi. The colour combo I chose using my Colour Coach - additional colour swatches for the 2011 - 2013 In Colours will be available for purchase on September 1. The senitment is from So Happy For You, that was available during this year's SAB promotion. As per usual, I never seem to get around to using my SAB sets until SAB is well and truly over. Be sure to check back tomorrow to see my JAI DT submission for more catalog sneak peeks! I love the mix of colours, Jo and the beautiful doily stamps. You're not the only one that doesn't use all the SAB sets straight away. Fabulous, Jo - love it! How great do those colours look together??! !